Miniature golf is a great activity, what is even greater is miniature putt putt golf rentals; we deliver the fun, to you! When you are putting on an event with a large crowd, sports games are a great addition. When you add on our custom built miniature putt putt golf to the event you are not only adding an additional element of fun but you are increasing the safety of the event. Adding items that spread out the crowd results in fewer people on each event item; line lengths will be shorter, and there is greater liklihood that attendees will have a more positive experience. 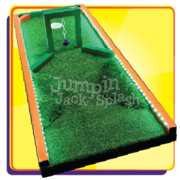 The Jumpin Jack Splash mini putt putt golf set has 9 unique and challenging holes. Each hole is equipped with LED lighting to bring a greater level of challenge once the sun goes down. Each LED lit set can change color and light pattern. In addition to being more challenging, it is just 100% more awesome! At Jumpin Jack Splash, we specialize in Unique Fun! Try one of our Giant Yard Games like the Giant Connect-4, Giant Horseshoes, Giant Jenga, or Giant Uno. These games bring a larger than life amount of fun for everyone!